Have you ever noticed more pains and aches following a traumatic event or after going through hardship? Did a painful loss stay with you as a niggling sensation in your body? Have you had tense shoulders ever since your difficult breakup? Or maybe you suffer from an ailment that you just can’t find an explanation for? When we don’t want to listen to our emotions, they will find a different way to attract our attention. What we feel doesn’t just go away. Emotions can actually physically change us. Our emotions and experiences are essentially energy and they can be stored in the cellular memory of our bodies. Does this ring true to you? Negative emotions can get trapped in the body and manifest as physical symptoms: pain, discomfort, tension. Not every physical ache necessarily has an underlying emotional component, but the connection is there and might be worth exploring. Is your body trying to tell you something by developing a tangible symptom that will make you stop and listen? The problem is that, despite all the signals, we often don’t listen and we forget to see beyond the physical. By mapping the body in this out-of-the-box way, emotional pain chart (see the chart below) provides a novel way to understand and interpret your body and mind. It suggests that every area of your body connects with a certain emotional state. Pain is a sign that something is out of balance or we have forgotten to address something. We might all experience and deal with things in our lives in different ways, but there seems to be a universal way of reacting to similar emotions and patterns of thought. We all store specific emotions in specific parts of the body and can have specific health conditions attached to them. Your body has a way of telling you what is really going on deep inside of you, in your subconscious mind. Now, you just need to translate the messages. By looking at the emotional pain chart, you might be able to understand your emotional pains and struggles better. 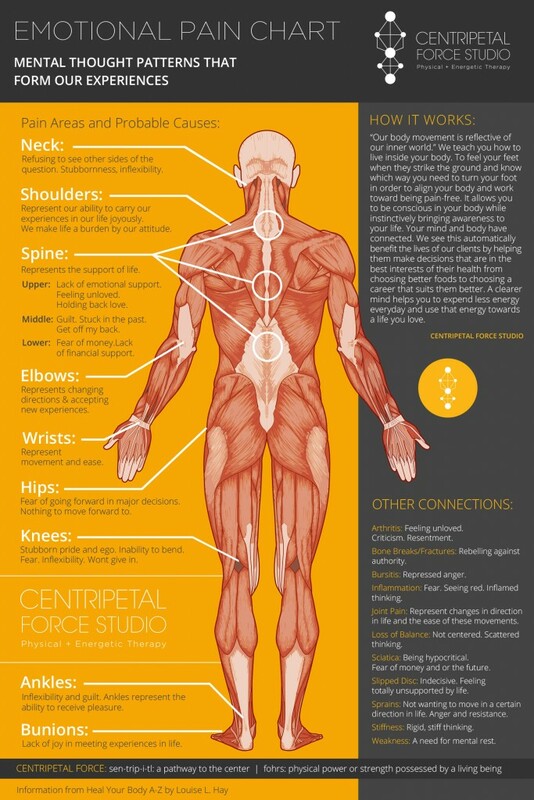 Different feelings correspond to different parts of the human body. Shoulder pain can be connected with a feeling of carrying a burden and having difficulty accepting and living your life in a joyous way. Problems with knees can point to a certain level of inflexibility in life, an inability to bend; an expression of ego that won’t give in. Also, some conditions and diseases have been linked to specific emotional states and ways of thinking. They are more likely to develop in people who follow similar patterns. For example, arthritic conditions have been associated with people who feel unloved or resentful, and inflammation can be a sign of fear. So, next time you feel an unusual pain or stiffness in a part of your body, stop and think. Is this sensation an echo of something else? What is your body really trying to tell you?